My day started at 0330. 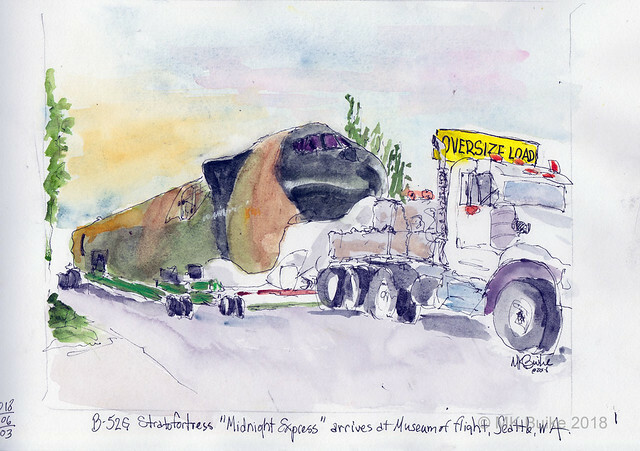 It was delivery day for the fuselage of the B-52G Stratofortress "Midnight Express". This is the end of the first stage of what will be almost a year long sketching and documentation project. I first sketched the restored aircraft at the Museum of Flight's Everett Restoration center on February 28. I visited four more times as it was dismantled for transport. The restoration of the B-52 is part of "Project Welcome Home" The Museum's end goal is to install this Viet Nam era aircraft in a commemorative park on the west campus. "The restored Midnight Express will reside on the west side of the Museum’s Aviation Pavilion in a serene park-like setting where visitors can reflect upon the B-52 and the nearly 8,000 other U.S. military aircraft lost during Vietnam. " First I drove past it in the opposite direction on I-5! 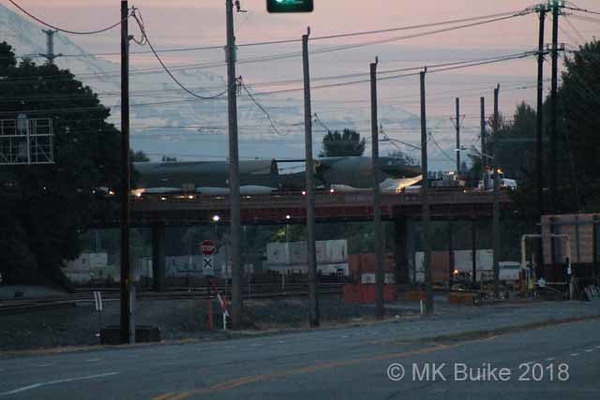 Then I positioned myself to see it travel over the bridge near Airport Way. Next I met up with it as it arrived at 0530 (a half hour early!) to the staging area a few blocks south of the Museum of Flight. There was a nice crew of Museum staff, volunteers and members there to greet it. Some of them had been up all night. My sole sketch today was done at this staging spot on the street. 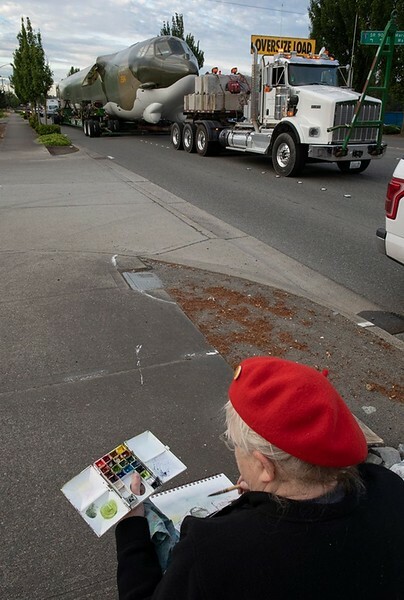 The Museum's "PR Guy", Ted, posted a photo of me sketching. I stayed until about 10 am to attend the welcome ceremony and then watch it move down E. Marginal Way to its parking spot behind the Aviation High School. Many more photos are here. A longer post on my personal blog is here. Good work and documentation of a unique event! Early get up! What dedication!